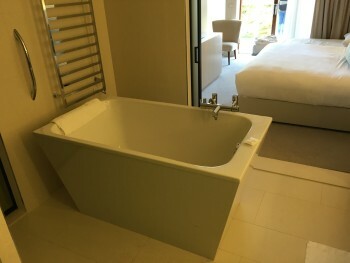 This is my review of the JW Marriott hotel and resort in Venice. 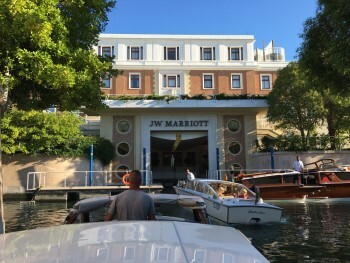 I have reviewed the JW Marriott in Venice before, two years ago to be exact. We were there again over the August Bank Holiday for what was our fourth consecutive annual three day visit, so I though it was worth covering again. All of the photographs below are from my 2016 review, but the text is fully updated. It seemed relatively pointless photographing exactly the same things again which is why my daughter looks younger than usual. Since this was our fourth trip, you would assume that we love the hotel. That is not true. Every year it turns out to be a frustrating experience. If Four Seasons took it over it would be outstanding, but JW Marriott lets too many things slip through. Let me explain why we returned. With kids, the mainland hotels (when I write ‘mainland’ I mean the main island) are not ideal – rooms are generally small and you won’t find a pool or outside space, let alone a kids club. Hotels on their own islands (Cipriani, Kempinski – ex St Regis – and JW Marriott, plus the Excelsior etc on the Lido) have a lot more to offer. The weather is also so hot in Summer that a private island is more attractive than the city centre. 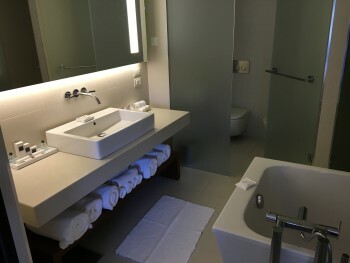 Marriott Rewards has one feature which I rate highly – the ability to ‘buy up’ a reward night to a better room for a nominal sum at the time of booking. Not all hotels offer this, but JW Marriott Venice does. We paid €200 on top of the usual 40,000 Marriott points per night for a Junior Suite which was selling for well over €500. The suite took two rollaway beds for the kids and still had plenty of space for a sofa etc. My Marriott Rewards Platinum Premier status got us two adult breakfasts for free so we only paid half-price for the kids breakfast. I’m getting ahead of myself, however. The JW Marriott in Venice opened five years ago. It is on a private island and requires you to take a boat to and from St Marks Square. It is bit further into the lagoon than the Cipriani and next door to the island hosting the Kempinski, previously the St Regis. The fact that St Regis threw in the towel after just one year tells you how hard it is to make money here – the long crossing from the mainland makes it an unappealing place to stay during winter storms. From the airport you are looking at €120 each way for a water taxi unless you take the boat to St Marks Square and then get the free hotel boat across. For the last two years we have arrived by train and taken a water taxi from the station, which costs a fixed €90. 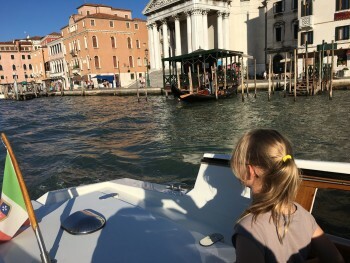 My kids and I think that Venice water taxis – especially when speeding across the lagoon at full throttle – are the coolest thing in the world and we consider it €90 well spent! My wife hides inside. We arrived in Venice by train as we came from the hugely impressive Cavallino Bianco family hotel in the Dolomites. If you’ve got kids and want a very classy mountain retreat in a picture perfect mountain town, take a look at Cavallino. The check-in staff continue to be poor. Every year they do something to annoy me. This time it was the announcement that they were “delighted to give me a junior suite” – which, of course, was exactly the room we booked. I don’t think that this hotel has ever given an upgrade to a Marriott Rewards elite member, although at least this year they didn’t waste my time trying to sell me one. There are rooms scattered across the island. The rooms in the outbuildings are more expensive and have private gardens or a plunge pool. You are never more than two minutes walk from the hotel so don’t worry about being isolated if you book one of those. We stick to the main building. 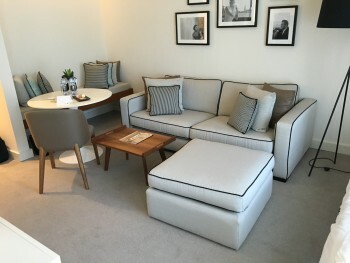 Your best choice with children is, in my view, one of the square Junior Suites at the back. Even if there are only two of you travelling I would recommend taking one of these because they are well shaped compared to some of the other slightly confusing room layouts. At one end of the suite is the bed. The TV console is in the middle and, behind that, you have a sofa and table. The two rollaway beds for the children – which are free if your kids are under 12 or a shocking €120 each per night if they are not – were by the window. 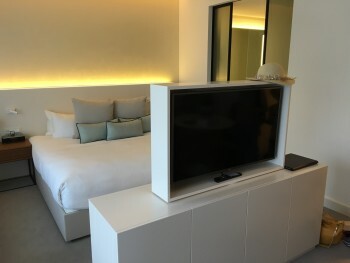 The TV set spins around so you can watch it from the sofa or bed. The channel choice is pretty poor, however. The room had a large balcony overlooking the grounds as well. I can’t knock it. This was a very impressive room. There is also a coffee machine, not pictured. There is a big problem, however. Wasps. Lots and lots of them. Plus flies, ants and pretty much every other insect you can imagine. This was a very hot Summer across Europe and insect infestation has been a problem in a lot of places. It is a particular problem here, and the staff admit that they cannot find the nests on the island. My wife left the patio door open at one point and a large number of insects got in. During the night we were all badly bitten – my kids looked like they had chicken pox. Amusingly, the restaurant tills are pre-programmed with a code for a 20% wasp discount. If you get attacked whilst eating outside, you get a discount as we found out one day. The JW Marriott Venice has a permanent kids club although there is no outdoor space, despite having a whole island at their disposal. It is charged at €25 per child per day, unless you pay the voluntary €39 per day ‘resort fee’. With two kids it is cheaper to pay the resort fee, except for the fact that you need to pay the fee for every day of your stay – you can’t pick and choose. 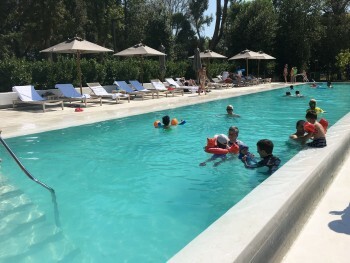 The ‘resort fee’ – which is voluntary – is a complete waste of time if you don’t need the kids club as virtually nothing else of interest is included. What is shockingly poor, though, is that the ONLY way to get the staff to unlock a bike so you can ride around the island is to pay the resort supplement. As we there for three days, we were basically asked to pay (€39 x 3) €118 to rent four bikes for 15 minutes. We might have (begrudgingly) paid €10 but not €118 …. The pool has picked up substantially in the four years we have been coming here. Originally, this was probably the worst kids pool ever built in the context of what could have been done. I could never understand what Marriott and the architects were thinking. You have a WHOLE ISLAND to play with and you build a pool which is ludicrously narrow. It is also far too deep. No child under 13 can stand in it. There is no shallow end. The hotel has addressed this, in part, by building a good-sized paddling pool next to the main pool. This is still not ideal because if your kids are beyond paddling age but under, say, 13 – which I reckon is the age they can stand in the pool – they are still stuck. The hotel has also added a lot of additional sun loungers over the years, as well as a parkour climbing course and some other outdoor toys (not pictured). There is a bar and restaurant by the pool. The wasps made it very unpleasant to eat here, and at €11 for a can of coke it wasn’t a cheap place to get a drink either. That’s the end of Part 1. 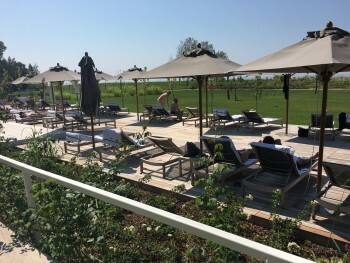 To read the 2nd part of my JW Marriott Venice review, click here. If you are reading this via email, you have not been sent Part Two and will need to click through to the main Head for Points website. Agree with everything you say. Particularly, the insects. I’ve travelled round the tropics but I don’t remember ever getting so badly bitten. We saw two people stung by wasps. We got away lightly though especially in the restaurant. I think the trick is for one of you to severely over DEET. That seemed to keep the insects away temporarily. Also agree about check in. After arriving on inevitability a very hot day, we were escorted to check in taken to a corner and then left there. I was parched with thirst but No cold drinks or refreshing towels on offer. After 10 mins I realised we had been forgotten so just jumped in to the next available check in desk. The check in assistant then told me the good news that breakfast wasn’t comped for the kids. I promptly replied that I had been assured in an email from the rooms divisions director that it would be free for all of us at which point she backed down and gave us all breakfast. They still got confused at the restaurant though every morning! To their credit though as plats they did upgrade us…to a junior suite although I had emailed the director about this proactively and it was at the front of the building without a balcony. I had to go and get that changed round to the back! Also, yes the main kids pool is deep but I think it’s fine if your children are competent swimmers. My youngest is 7 and had fun in there. Rob, your money ,and a lot less of it would be better spent at Union Lido or somewhere just like it. The kids would have a fantastic time. And you could save your points for you and the missus. 11 Euro for a can of coke…….sorry I don’t care where you are or how much money you have that’s ludicrous. €11 for a can of Coke? There has to be better options than Venice – just seems they get you on an island and charge the world for it. We only pay $7 for a Coke in the Maldives! In 2005, I paid $1.50 + 10% service charge, rounded up to $2 (no American coins in the Maldives!). I thought that was expensive but then I grew up in a country where a Coke was 16p from a supermarket and 8p on the roadside if you gave the bottle back (again in 2005, when I was 15 years old). Our kids have never been into fizzy drinks so we save a packet at 5* hotels-l and the last time I had coke was in the toilets of MoS over 20 years ago and even then £11 would have be a steal! Sorry Rob you aren’t selling this place! This is why the headline parts of Europe are no go in summer. Venice, Barcelona, the Amalfi coast etc…crammed full of gormless tour groups, disgustingly expensive and the locals are out to shake you down for every last dime. Mass tourism has killed these places and they are now hellish in summer. I just can’t understand why people would do it to themselves! Unfortunately, mass tourism (when left entirely uncontrolled) can lead to the destruction of the thing(s) which people came to see. Venice long ago ceased to be the beautiful mercantile city of quiet canals and masked celebrations. Similarly, the constant trample of tourist feet is ruining the landscape in many of our national parks. Barcelona have attempted to prevent the creation of new hotels and AirBnB listings, but I can’t see how viable that will be in the long term. OT but excited to have booked a good deal in the BA holiday sale for January 3 nights in a cute hotel in Venice abs business class return for 2 . £700 . I’ve never been to Venice before so am looking forward to it being quiet – and no mosquitos ????. It won’t be that quiet in absolute terms. Always full of tourists, even in mid Winter. The Hilton in Venice is excellent. Also has a pool. Does not have insects. Well worth a try and is also away from the maddening crowds across the lagoon. +2 I really enjoyed my stay at the HIlton although the lounge is a little small. I did get an upgrade to a suite though. Gritti Palace (if you don’t have kids) for Venice. At a Hotel in Thailand I used the cans of beer and coke from the mini bar whilst at the pool through the day then replaced them from a local store on the way back to the hotel after a night out. Then I’m cheap. I assumed everybody does this… we were on first name terms with the lady at the Poo Mart (not spelt this way) in Khao Lak as we went in for 8 beers like clockwork after dinner every evening. What is the average age when UK kids learn to swim? Being able to swim and being able to spend substantial periods in a pool where your feet can’t touch the bottom are two totally different things. How long could you spend in an 8-foot deep pool? Enough to get / jump in, swim a couple of times back and forth, and then get out to lie in the sun, giving way to others! Yeah, because that’s what kids do in swimming pools ….! To be honest they seem to spend most of their pool time at the JW in Venice jumping in, getting on those blue floating things or in the fountains. Started mine in Tadpole classes at 6 months. Sorry but can someone tell me what Wasp discount means? If you get attacked by wasps whilst eating, you get 20% off. This is clearly open to gaming if you bring your own wasp. Are they easy to keep on a lead? I’ve always been frustrated by the Laissez-faire European attitude to stinging and biting insects (and I’m half Spanish!) I am a mosquito magnet and much prefer the US and Caribbean where they are treated as a real pest and subject to eradication programmes. We haven’t been to Italy in years but got a BA holidays deal to Rome for next Easter – I see the country is as expensive as ever! Fortunately I’ve booked a suite with a fridge so we can stock up on drinks and snacks. I am a true Northerner and thought 4 euros for a coke was outrageous at a beach bar in the south of France earlier this year lol! This year was the first ever when nobody got bitten by a mosquito in our 6 weeks out there over the summer – place in the sun. Not even a whining dive at night. I know the mozzies were around a few hundred kms away, as people reported it on the local forums. None where we were, though. Plenty of wasps in our garden but they just leave you alone, pays to cover up your tinny with [anything] so that you don’t take a swig & get bitten.